It’s definitely time as the sprites are making their way north! The key to attracting migratory birds like hummingbirds and orioles is to be ready prior to their arrival. Even when trying to get resident birds (like bluebirds) to nest, houses should be ready while scouts are claiming territory. 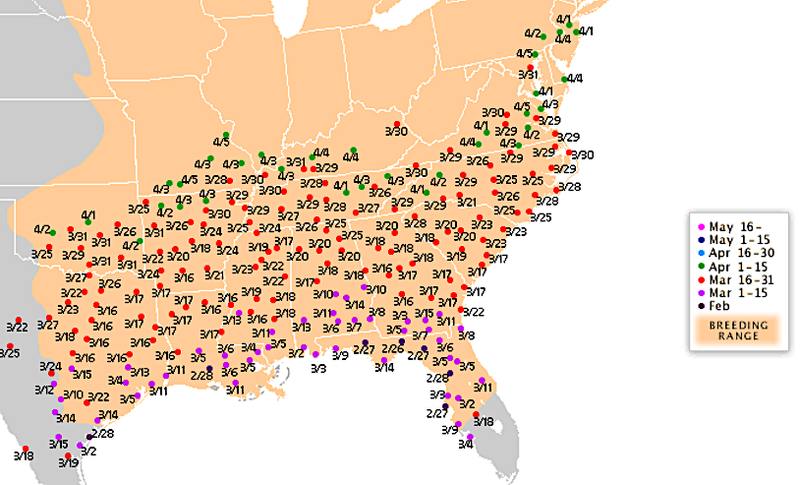 So by the looks and dates of the migration map, hummingbird feeders should be up and filled now to welcome Ruby Throated friends. It’s a long journey for the little guys and natural food sources are still scarce as snow flies across much of the mid-west and northeast US. Whether the weather decides to cooperate or not… birds will make their way and nature will take her course, some years migration is easier than others. The very same day we spotted our first hummingbird in GA, American goldfinches’ first molt was completed. Overnight, these birds turned bright yellow with summer (or breeding) plumage. It’s the new craze that provides big thrills. Getting so close to such a tiny and amazing creature and just feeling them on your hand gives off a d ose of adrenaline! How to explain that? We can’t- but you’ll see countless videos of folks using Nectar Dots, Whimsy Wands, Hummer Rings and other hand held feeders to experience the thrill. Reactions are priceless, and videos go viral. To perch or not to perch? It’s likely a matter of preference and what style feeder’s best for you to maintain. We prefer perches as hummingbirds can rest while feeding thus conserving energy. But in nature most flowers which hummingbirds feast upon… don’t have perches! Folks always ask “What’s the best feeder?” or “What’s the best bird bath?” Simply put, the best of anything is the one that you will maintain. 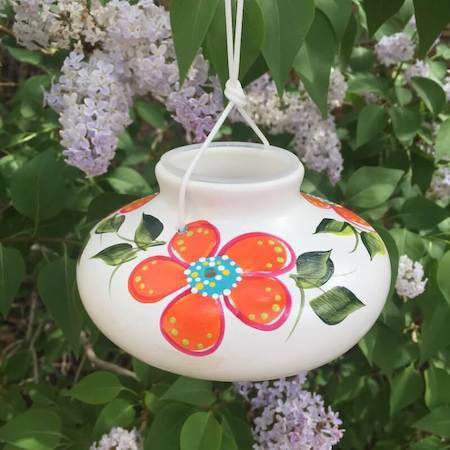 But we would suggest ceramic or glass hummingbird feeders in a saucer style that won’t leak or drip. It’s SO EASY! The ratio is always 1:4, pure cane sugar to water. No need to boil water but 1 part water will dissolve sugar quickly and effectively. Add 3 parts cold water and eliminate cooling time. Economical, simple and best for bird’s health too! Happy Birding and may spring head your way soon! It happened last year too, we skipped out on the blog from Mother’s Day until well after Father’s Day… hate when that happens, especially with all the happenings and splendor of spring backyard birding. We hope you’ve been blessed with many successful broods, maybe you’ve seen a monarch or two, bluebirds fledge, and that your hummingbirds returned from last year to bless your garden for the season! If this is your first stab at the addictive hobby, we hope you found lots of joyous moments and wonder with new avian visitors and that you’ll continue enticing new feathered friends with food, water and shelter. Now that summer is waning and daylight hours are fewer, hummingbirds are preparing for migration. It has nothing to do with temperatures and it’s a total myth that leaving feeders up will prevent them from going. So leave at least one feeder up for stragglers! Their long journey south requires extra fuel, so they’re fattening up and absolutely owning their favorite humming bird feeders! If you think the sprites were a tad territorial before… just watch- it’s magnified ten times now! The show is mesmerizing as crowds gather and vie for a feeder to call their own. Have one of those hummingbird swings that was never really used much? Watch! Just watch the little guys fight over that too! These cool humming bird feeders have a great feature for expansion or vertical linking without extra hooks or hardware to get lost. Recycled glass in a top-fill, no leak design just rocks! They’re easy to clean and less likely to mold as plastic does. The coolest thing? Remove the lids for winter and you’ve got a great multi-use bird feeder for resident friends; use suet, peanuts, meal worms, nuggets, jelly or fruit. The same feeder/idea comes stepped-up a notch in vivid red with circular perch. We think (but can’t promise) hummingbirds prefer to perch while eating as it conserves energy. Put 2 or 3 of these glass hummingbird feeders together and use them year-round for chickadees, nuthatches, wrens, bluebirds and other usual suspects! And should ants ever become a problem… don’t forget the moat! 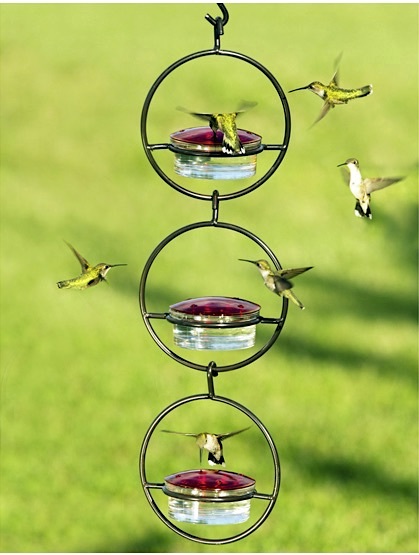 The best investment ever for feeding hummingbirds- or orioles- or butterflies! Any time there’s sweet, sticky nectar, fruit or jelly, you can easily keep pesky ants at bay with plain water inside the moat. The birds will thank you! Safe travels little ones… hope to see you back again next year! For next season, here’s the simple nectar recipe and helpful guide for keeping nectar fresh. Cloudy nectar is always a sure sign the solution needs to be changed! Be it a feeder for seed mixes, or nectar feeder for hummingbirds, attracting and watching backyard birds is simply good for the soul! We’re not sure if the popular pastime is something that coincides with age or the crazy world of being hyper-connected all the time… maybe a bit of both perhaps? A bird feeder makes life sweeter, though it’s hard to put your finger on the actual feeling of how. Unplugging, communing with nature (from the comfort of your home), being detached from daily chaos… it’s a connection that’s intangible. And until you’ve tried enticing birds with a feeder or two, it’s difficult to explain. It is a well known fact however that many folks become hooked, simply addicted to backyard bird watching! The kind of “learn as you go” hobby, there’s not a whole lot you can do wrong, but there are a few easy hacks to make the experience more enjoyable. With migratory birds now making their way across the gulf and lower states to summer breeding grounds, many folks eagerly await their arrivals. Hummingbirds, orioles, martins and others will be welcomed with opened arms, specialty housing and bird feeders made just for them! These birds generally claim the same territories every season, something John James Audubon discovered in the 1800’s using a simple silver thread for banding a few birds! So what are a few hacks or tips for better bird-watching? Baffles: Foil squirrels before they become a problem! Baffles work beautifully if used correctly! 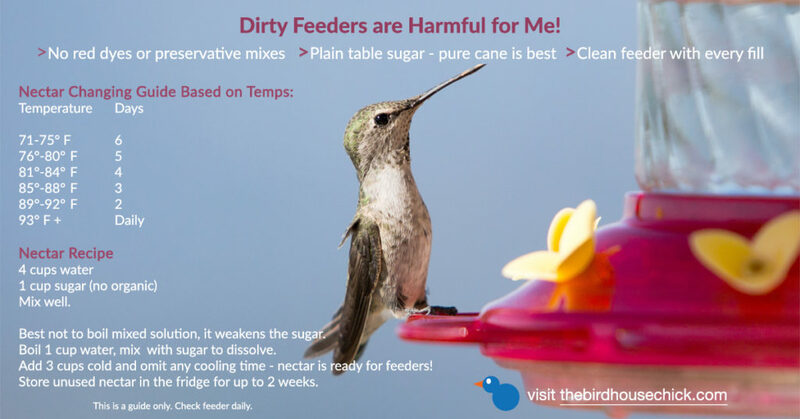 Feed Clean: Birds are like little kids and go for the good stuff. If using cheap birdseed, you can bet much of it will land on the ground. The fillers aren’t nearly as tasty as the main seed, so why not just buy better quality seed? Seed trays also assist in a clean feeding strategy. 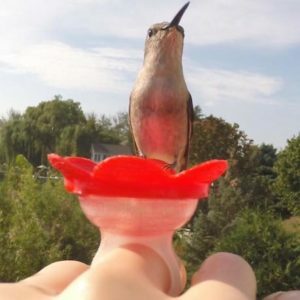 Ant Moats: Need we say more when feeding hummingbirds? The ever critical accessory helps keep nectar fresh and pest-free. Because ants can’t swim, hummingbirds and hosts will be much happier! Make Your Own: Nectar for hummingbirds, orioles, even butterflies. It’s just pure cane sugar and water with different ratios. Mix up a batch of suet and store in the fridge, same for Bluebird Banquet. Use recipes which omit lard for summer feeding as the gunk will turn rancid in heat. Cleanliness is important for your feeders and the areas around them. Because birds gather in unnatural groups at feeders, disease is spread more easily. Keep any bird feeder free from nasty build-up of bacteria and mold… they’re air-born killers for birds via respiratory infections. Keep ground below feeders clear of spilled seed as well. Add some fresh water in a bird bath and keep it shallow, plant saucers works great! And for those who “don’t feed the birds in summer” you’re the one who’s missing out. The birds can get along just fine without your bird feeders, but scenes of parents with fledgelings are most entertaining, something you won’t see in winter! There’s all sorts of cool accessories these days to further entice hummingbirds; from the highly popular Hummer Helper Nest Material, to Leaf Misters in the garden and the ever critical ant moat which keeps nectar ant-free. But hummingbirds don’t survive on nectar alone, be it hummingbird feeders or nectar-producing flowers. They (as many other birds do) require insects for survival. Their tiny but oh-so speedy metabolisms thrive on protein. Babies in the nest require protein- which nectar does not offer, plus transporting the sticky solution back to the nest is probably very difficult- if not impossible for the attentive and hard working mama! 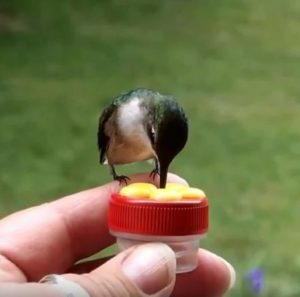 Imagine feeding hummingbirds without messy nectar? And feeding them one of their very favorite, protein-packed foods? It’s fruit flies! Yes fruit flies may be a royal pain when flying in the kitchen, but outdoors, the tiny insects are coveted for their nutritional value. Here’s a whole new way to feed the tiny sprites, all natural and super healthy too. 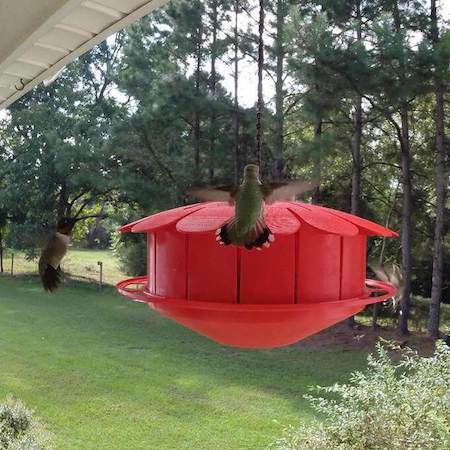 Enter the new Humm-Bug Protein Hummingbird Feeder. 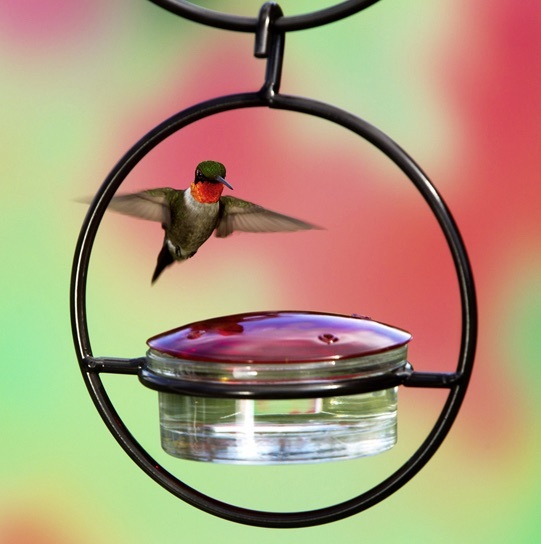 An innovative feeder that incubates and offers fruit flies to hummingbirds. An all-around perch lets them rest to eat should they ever decide to sit still. Instead of changing nectar every 2-3 days in hot summer weather, just replace fruit and vegetable scraps every 3 weeks… rinse well when re-filling of course. No more fighting over a feeder port, no drip, no mess, no mixing, no bees or wasps and no ants! We’re thoroughly stoked to try out this unique humming bird feeder… check the video to see the Humm-Bug in action. The Best Valentine’s Gifts are for the birds! Because they’re long-lasting and provide daily joy and entertainment, kind of a reprieve from the chaos of life. They also help wild birds thrive, especially in winter. 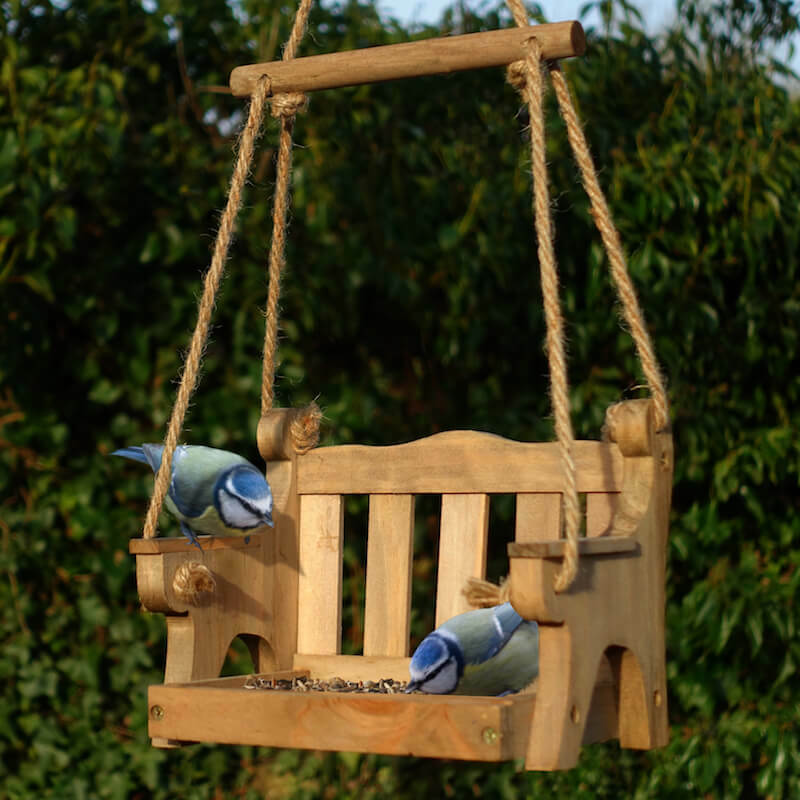 Roses fade quickly, chocolate’s gone in a few days, but gifting a unique bird feeder is something that will bring happiness for years to come… think about that for a moment! 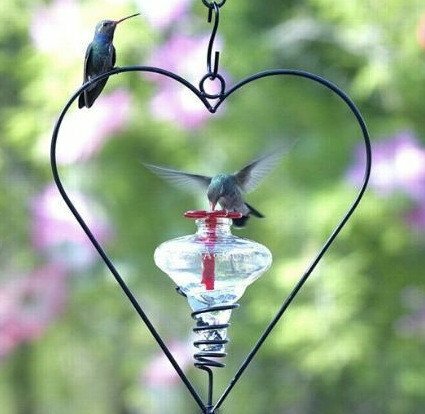 This Glass Hummingbird Feeder has the perfect Valentine’s theme! The tiny sprites bring so much joy to both novice and seasoned bird enthusiasts alike. Parasol crafts quality bird feeders that really do last a lifetime. Eco-friendly from recycled glass, they’re hand-blown in Mexico by true artisans. 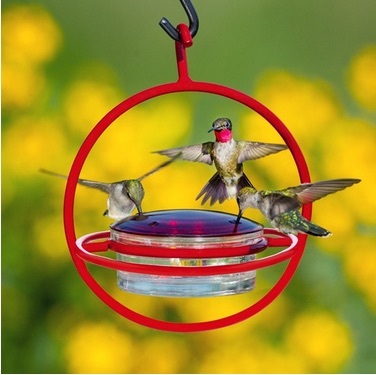 Hummingbirds love them and the top-fill design offers a no-leak, no-mess feeder. 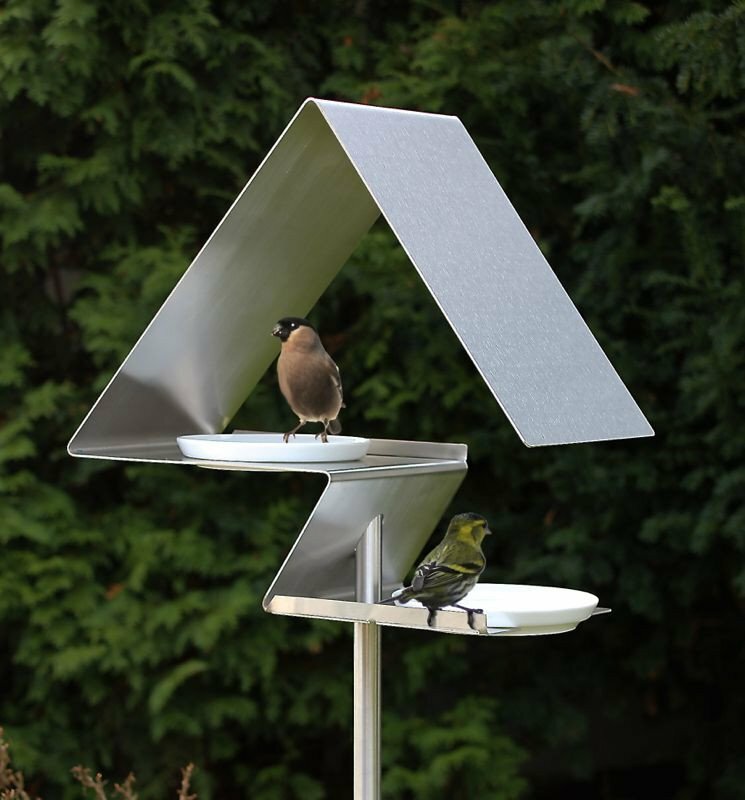 Something a bit more substantial might be in order, and should the recipient lean towards contemporary or modern styles, the Bauhaus Bird Feeder rocks! It’s versatile for different foods and fresh water – which attracts more birds than anything. Handcrafted in Europe, the clean lines and sleek style look beautiful in the garden. Definitely a keeper, this stainless steel feeder remains rust-proof for the duration! 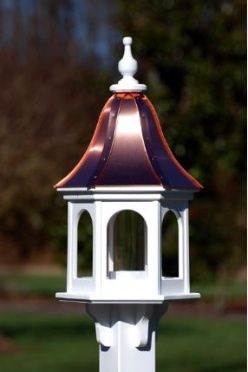 Last but certainly not least… a post-mounted copper/vinyl feeder is tops! 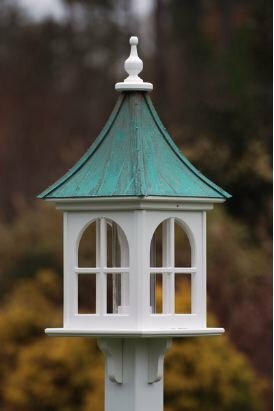 For a special Valentine’s Gift that’s more traditional, copper roof bird feeders are guaranteed for life. Simply stunning and superb quality, the vinyl looks like wood though it will never crack, rot or fade like wood does over time. The non-porous feeding surface is also healthier for birds. The copper stays bright & shiny for 4-5 years before weathering dark, and there’s a patina roof option which remains indefinitely. Either of these unique bird feeders promises to be a coveted gift bringing joy and happiness (and songbirds) for many seasons to come… making it a perfectly swell gift for your love bird! While our previous post touted the benefits of offering nyjer (or thistle) seed, this info extends the offer through Monday night, 11/28. For Black Friday, Small Business Saturday, Cyber Monday… wait, no shopping name for Sunday? Someone dropped the ball! Enjoy 10% off and nab a free nyjer feeder sock with every purchase. These little feeders make fantastic stocking stuffers because birds really do use them, great quality too. You may even opt to keep the gift for your own birds! Nyjer is an ideal seed to try if you’re just entering the backyard bird watching hobby. More of a journey as it becomes so darn addictive! 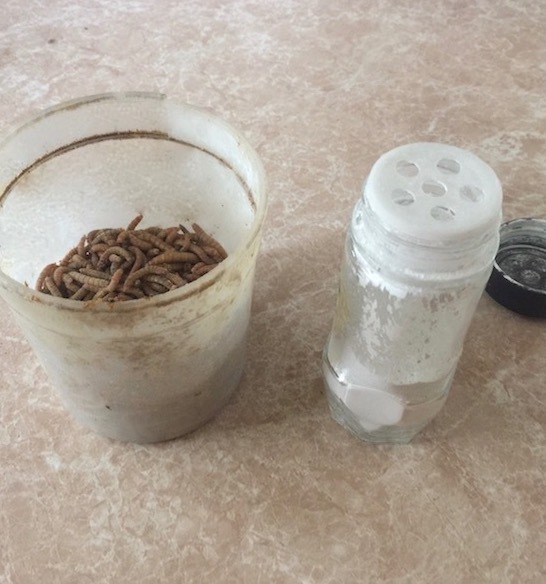 Hard to explain, but once bitten by the bug… you’re hooked. Another petite nyjer feeder, although not free, is the one-quart feeder. It has a molded acrylic dome and tray for extra perching space. In red, orange or yellow, it will prove to be a most popular spot in the smallest of spaces! For those who enjoy the long lines, traffic and overall chaos of the holiday shopping season… hats off to you! For those who’d rather shop from the comfort of their sofa in PJ’s… (yes, please) look no further. Find the best birdhouse and bird feeder gifts when you “shop small”. Boutique shopping rocks as many items are one-of-a-kinds and unique wares. 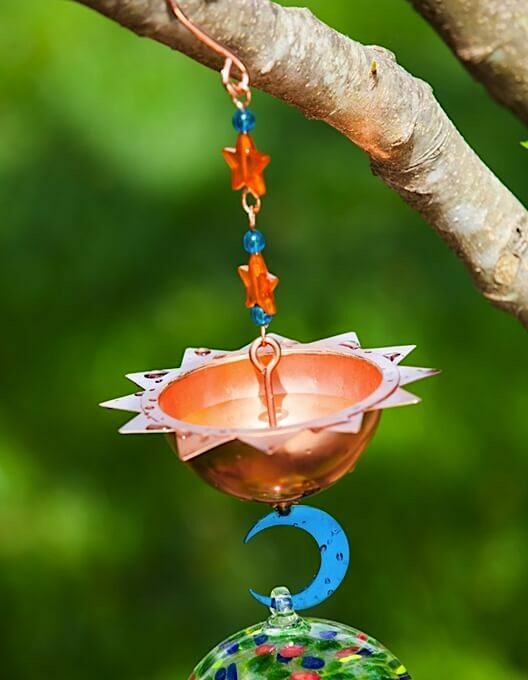 Beyond birding, find cool yard art and unusual accents for home and garden decor with fun metal yard art too. Lots of holiday theme gifts they’ll use for seasons to come! 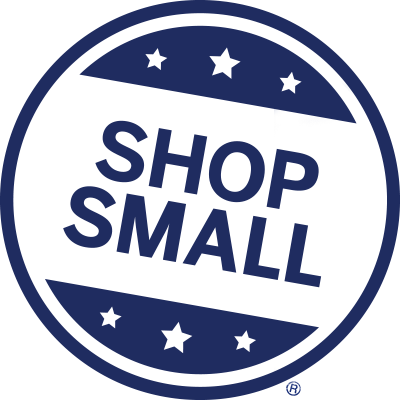 We’re part of Shop Small so Am/Ex customers earn 2x points when shopping with us through Dec. 31st. Visit the official gift guide, or check out birding resources to see daily suggestions for all 12 days. 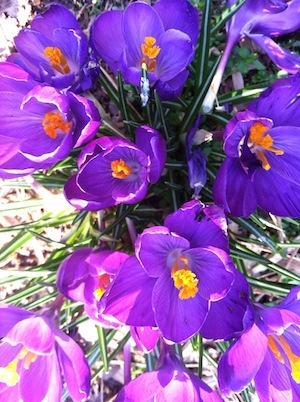 Find something for all nature buffs on your list today and nab a free nyjer sock to boot! Use code MC10 while this offer lasts! Nab a Free Thistle Sock with Your Order Today! 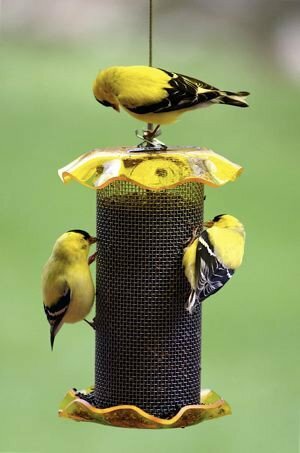 Because the American Goldfinch resides across most of the US, these fun little thistle feeders are likely useful in your locale. Get one FREE with your purchase… and cross off a stocking-stuffer on that list! It’s an excellent way to introduce someone to backyard bird watching without going all-out! Among some of the sweetest songbirds, goldfinches would rather take flight than vie for a spot at the thistle feeder. With their late breeding season, June through September sees the most activity. After that, a second molt brings new olive drab feathers for winter. Breeding plumage occurs in late spring when the most vibrant yellow feathers appears. Parents feed thistle almost exclusively to babies so feeders do tend to get crowded. They don’t use birdhouses, instead nesting in hedges or trees with nests constructed of woven plant fibers lined with thistle (from the weed) or milkweed down. 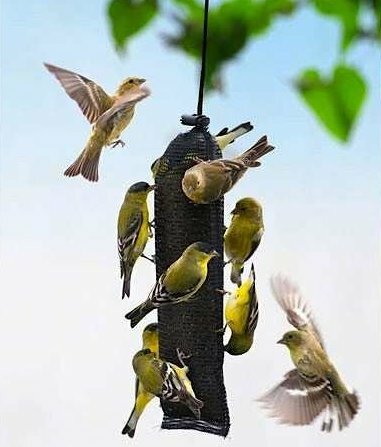 Another fun feeder which doesn’t require much space at all and accommodates 18 birds at once is the Rainbow Finch Feeder. Tall and slim, when all perches are occupied it’s quite the captivating site! 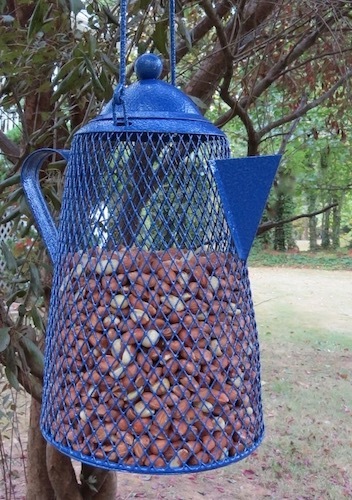 Any birding enthusiast would be elated with this cool bird feeder. It’s easy to fill and clean and fairly obvious birds love them. Best of all… it’s on sale! 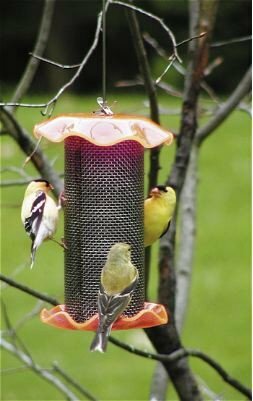 • Squirrels usually leave these feeders in peace! 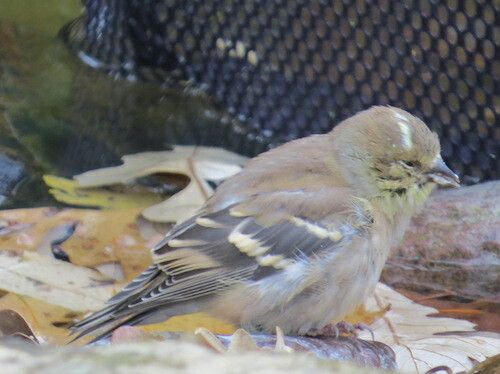 • Other birds in the finch family may frequent the feeders such as indigo buntings, red polls, pine siskins and more. Yes, the sweet canary-like birds even earned the name “Charm” when referring to a large group! Lovely song and non-aggressive… why wouldn’t you entice them to your place? Offer good through Monday, 11/28/16 and should cover Black Friday, Shop Small Saturday, Cyber Monday and any other big shopping days! 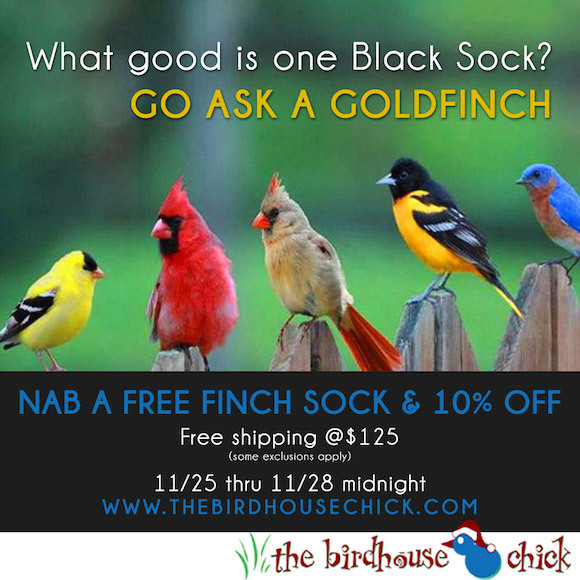 Get someone hooked on birds and get your free thistle sock today! Wishing the happiest of holidays to you and yours! Give birds peanuts… because variety is the spice of life! 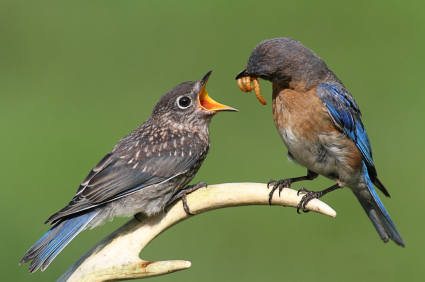 Be it shelled or whole peanuts, birds love them and for good reason. 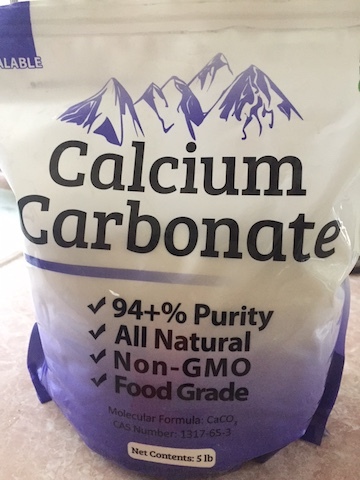 They pack a real punch for nutrition and likely for taste, but you’d have to ask a bird on that one. 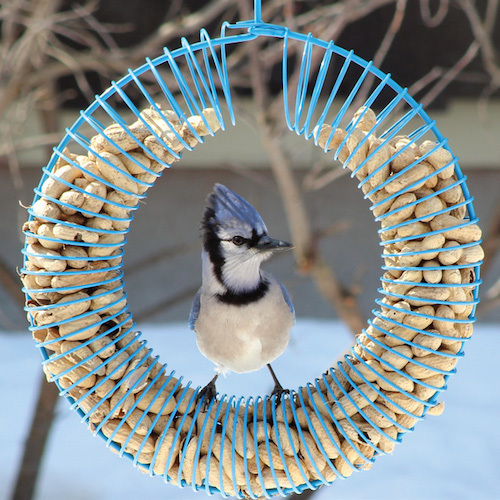 Simply put, Calories = Energy, so especially for cold weather feeding, peanut bird feeders are always a good bet. That energy is what keeps birds warm overnight. Ever wonder why many resident birds feed from dawn till dusk? The goal is to store enough energy to make it through a frigid night. The Wreath Peanut Feeder above is meant for whole peanuts, but it’s easy to pop a suet ball or two inside for more variety. The design is very bird-friendly and even lends itself for other options. In early spring, it’s ideal for nesting materials. Start saving your pet’s hair from their brush now. Decorative mosses and feathers are also prime materials for nest construction by most of the usual suspects. Steer clear of dryer lint- though it may seem soft & fluffy, it contains synthetic material that’s just not found in a birds’ world. Say you could do without the mess of peanuts in the shell? Opt for a feeder that’s made for shelled peanuts. 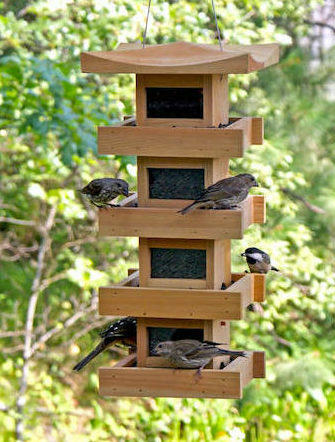 Most of these will accommodate black oil sunflower seed so you can still change it up, enticing more birds to your place. The large capacity mesh design offers lots of all-over feeding space. Most styles also lend themselves to doing the nest materials in spring. Adding suet may not work as well in shelled peanut bird feeders as there’s nothing to hold it at the outer wall for easy access – though you’ll likely be able to do black oil sunflower for variety.